I don’t want to bore you with my history other than to give you some perspective from which to understand my mission. I was eight years old when I stood in B. Dalton Booksellers looking through a book that was as colorful as candy. 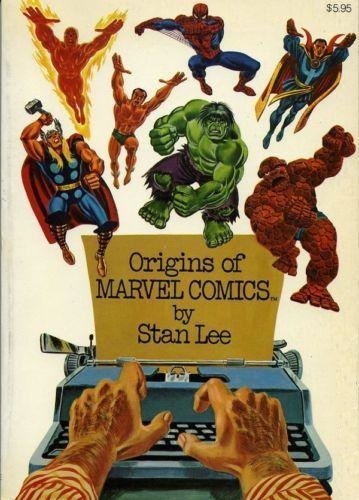 It was 1974 and the book was Origins of Marvel Comics by Stan Lee. It was my introduction into a new world, a new passion…a new life. Fast forward many years and many dollars-spent-on-Marvel-comic-books later. Long-gone were the days of creators like Lee, legendary artists/story-tellers such as Jack ‘the King’ Kirby and ‘Sturdy’ Steve Ditko. Long-gone were the comics and creators I had grown up with. Long-gone was the Marvel Age of Comics. But a fire still burned for the nostalgia of the old days. A love was still kindled for the classic stories and characters and creators who were like family. And I knew there were others who felt the same way. There was a generation of fans of the Marvel Age who pined for the lost beauty of a mythology that had been such an enormous part of my childhood. In the darkness of my despair I saw a light. There were still decades of Marvel comic books I could go back and read. Or could I? Comic speculation of the 90s had eventually crashed the market but prices were still high for a complete reading collection of the entire Marvel opus of the Silver Age, every single comic Marvel had published from, roughly, 1961 through 1978 . But I had a cause now, a raison d’etre. I would find an affordable way to read that mythology in its entirety. And then I would read every single issue. And I would write about it. I would read every comic, I would elevate every creator, I would espouse every character, their origin and first appearance. I would recreate and relive every month from the dawn of the Age to the end. I would live it through eyes alight with renewed wonder. And then I had an even better idea – I would bring others along to read them with me, others who shared my same passion for the comics of our youth. And we would talk about them. We would debate their merits and their shortcomings. We would argue over which of our favorite heroes would win in a fight. When undertaking such a Herculean task as I had saddled myself with, one must be able to look at it from all angles, to see how it should be broken down and structured. After the initial overwhelming realization of the enormity of this feat had passed, I quit sucking my thumb and emerged from the safety of my closet. This was essentially a trip through history so a chronological arrangement was what was called for. I would start at the beginning and, like a good archaeologist, uncover and examine each artifact as it was brought to light. And so, here I am! I know my starting point! I know where I am going! Come along if you want to experience the most pulse-pounding ponderings of past perfections ever put upon an aporetic population! Welcome to the Marvel Age of Comics!